2011-05-22: I only recently was introduced to 'Qt' - http://qt.nokia.com/ - but have quickly taken to is as a very good cross platform application and user interface (UI) development tools. It comes in two(2) forms - a commercial version, and an LGPL version. Of course here I am only talking about the GPL version! For a long time I have looked for a cross-platform Integrated Development Environment (IDE) which did all, or at least most of what the Microsoft Visual Studio (MSVC) IDE provided. Perhaps the most important being the context sensitive popup/tooltip information. By this I means you can have a defined structure, declare an instance of it, than after you type a '. ', or a '->' if a pointer to the structure, and combo box popups showing all the members available. But it is more than this massive popup, tooltip assistance, you can compile the 'application', and run it under the debugger all from within the IDE. If there are compile problems, you can instantly get the line of code in error to fix it, and under the debugger you have a full code view available, thus you are able to trace through the 'written' code. But in SOME cases I have NOT included any 'executables', since the idea is that you download and install the 'Qt SDK' into the OS of your choice, then unzip these examples into a folder of your choice, and load the included '*.pro' project file into 'Qt Creator' and build your own executables. 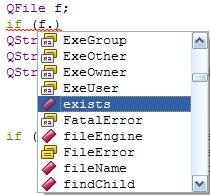 Where there are executable, you will still need to 'deal' with the required runtime DLLS, given down the page. download : The item 'download' is quite interesting in that it is a reasonable simple replacement for GNU 'wget'... and I have extended it to 'understand' the first response from the flightgear mapserver is just HTML, giving the 'name' of the desired zip file to download. As suggested above, you can get the full set of Qt windows 32 runtime DLLS by downloading and installing the Qt SDK, but the download below is a minimal list needed to run my 'example' applications.